The third EP by Israeli noise rockers OX4 was pencilled in for release on October 2, 2013. It was supposed to be called Where Is My Rainbow. Apparently they had a change of mind after needing to find a replacement for the drum throne. The EP was pushed back and they decided to call it Hyper. It's an apt title for the first four tracks - energetic songs grounded in O. Furr's buzzing bass and S. Zax's cymbals heavy drums. Guitarist Johnny Lawrence takes care of the melody, alternating between the Velvets, Blondie and Teenage Fanclub. Singer Michal Dar stand her ground amidst the mayhem, quite a feat considering the volume she has to beat during One day I'll Walk Away. After kicking off the EP with the upbeat, but innocent Hold Your Hand things come a head (no pun intended) with the final track, the slow acoustic Sexual Fantasies, one of the projected tracks for shelved Where Is My Rainbow EP. It features the band's previous drummer Dave Hamenachem. OX4 have reinvented themselves with this new line-up, which keeps them in the front ranks of the Jerusalem underground rock scene. For the record: there is a song called Where Is My Rainbow, but according to bass player O. Furr it sounded pretty bad. It might surface as a B-side. 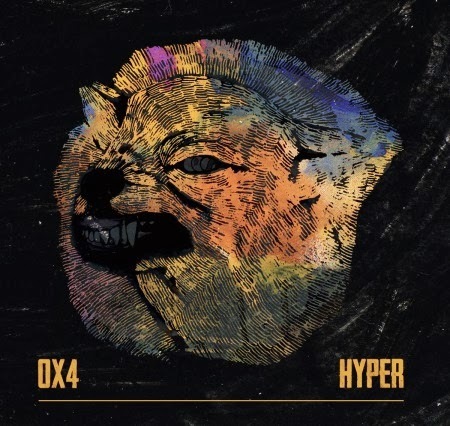 Hyper is a self-released EP. Buy it from the band's website.